Hi beginners! Thank you for following along with this series, we have covered so much! Today I hope to clarify one HUGE part of sewing that in the beginning isn’t always very clear and can be confusing when you are just getting started. What do we sew? Well fabric of course! Sewing with the fabric that is specified for your project is critical to creating a successful item and having it look as great as you hope and expect. How can you ensure that you buy the right kind of fabric for your project? Well, to get started, you need to know the difference between wovens and knits. Omigosh, I know. Don’t worry, today’s lesson will help you with this hurdle. When you go to the fabric store, there are so many options that it's hard to know where to start. We’ve got this! Let’s start with getting familiar with the two types of fabric that you will likely use the majority of the time. And yes, there are subcategories within woven and knits- but lets not go there yet. We must simplify. First, I want you to head over to your closet or dresser, and look at your wardrobe. Likely a lot of it is made out of stretchy material. T-shirts, leggings, athletic gear, sweatshirts, sweaters- this is knitwear. And the modern wardrobe is comprised mostly of this type of fabric. Knitwear is comfortable, its easy to wear and layer, and it can be cool in the summer and warm in the winter. Who doesn’t own a T-shirt? Now, look at your wardrobe again, what is it that you have that does not stretch? When you look at your other pieces, like button down shirts, jackets, some skirts, pants, and dresses, likely they have a lot of structure and don’t stretch very much. In fact, when you pull on the fabric the same way you would a t-shirt, it likely has no stretch and you run the risk of tearing it. These items also have buttons, zippers, or snaps because otherwise you can’t get it over your head. This my friend, is woven fabric. The threads or fibers that make up the cloth is woven together on a loom. These items have a more precise fit, and if you grow out of them, that piece goes to the back of the closet because it does not stretch. They are sewn from woven fabric, and it is the type of fabric that your conventional sewing machine sews best. And its also the fabric that most beginners start to learn first, because its easy to manipulate and you can make simple clothes, crafts, and accessories. Cotton, linen, wool, denim, corduroy- most of these fabrics are woven. Now, be careful, there are knitwear versions of these, so lets get down to the essentials that you need to know. This is a beginners series, so likely, none of us are masters of the textile realm and know what the difference is between a cotton twill and a viscose rayon. Just looking at your sewing pattern, and the fabric it calls for can be daunting. So I’m going to teach you how to go by touch and handling of the fabric. 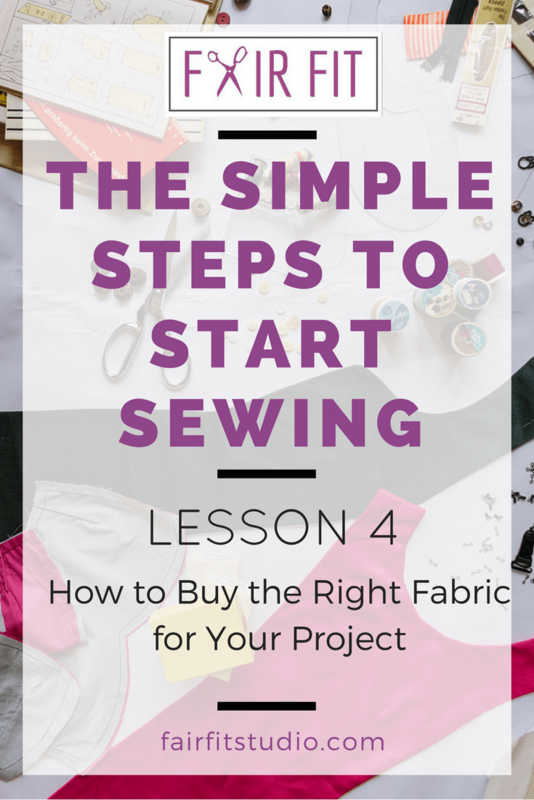 Any project that you pick out, from a pdf pattern that you find online, a Pinterest tutorial, or a sewing pattern will tell you the required fabric for the project. Check out this bag pattern I had in my collection. It says “Designed for medium to heavy weight woven fabrics.” And then goes on to name twill, denim, leather - ect. Don’t worry about the sub-categories. The point is, it says woven. You need to know how to recognize woven fabric. It doesn’t stretch like a tee shirt. It should feel firm when you pull on it. It unravels where you cut it, so if you look at the cut line at the beginning of the bolt, you should see little threads coming apart from the fabric. It comes in prints and solids, and is usually the most prominent fabric in the store. If you are still confused, go to the store, and ask the employee to show you woven fabrics. They will guide you to the section of the store. Touch those fabrics and apply the three concepts I just discussed. Most beginner’s sewing projects are made out of 100 % woven cotton. Like cute calico dresses, fun craft sew ups, woven fabric is easier to handle. It is easy to cut, and it is easier to sew. The problem starts when you want to start making clothes for yourself. If you look at your wardrobe, the most simple looking items are your t-shirts and leggings. However, these are made from knit fabric, and even though our knitwear is actually more simple in construction and design, it is a different type of sewing in construction and process. Over the last year, I would see students take Beginner’s Sewing and then be ready to start on a clothing project. However, that clothing project was most likely a knitwear project, because that is often what we consider simple clothing. Lets clarify what knitwear is so that your sewing practice enables you to really make the clothing in your vision plan. Working with a stretch material like jersey, interlock, double knit, or spandex, means your handling of the fabric will be different than sewing a non stretch cotton, linen, or wool. There are times when you are going to stretch the fabric as you sew, and there are times when you are going to make sure that the fabric isn’t stretching as you sew. To finish knitwear and make it look like the items that you have in your closet requires different kinds of hems, facings, and construction seams. Knitwear isn't that hard to sew, and its fast. But here is where I’m going to differ from the advice some people encourage online. Yes, you can sew knits on your conventional machine with a zig zag stitch. However, I highly recommend that if you are really serious about making clothing that you invest in a serger. In the beginning, you can make a few knit garments on your conventional machine, however, they are going to look homemade on the interior, and not hold up as well in the long run as knits sewn on a serger. For years, I tried to make knit clothing without a serger, and I just didn’t like them. The seams would break if I wasn’t careful to not stretch them too much when I would get dressed. Yes, you can stretch a seam as you sew, but you have to be so careful to not stretch it too much and lose the shape. Now that I have a serger, I can finish a tee shirt in 30 minutes. Sergers are beneficial with woven fabric too, and I believe they are a good investment since they are pretty much the cost of a basic conventional machine. Check out last week's lesson on machines to learn more. Just like you need the right tools to build homes and furniture, you need the right tools for sewing. A serger will speed up your process and in the long run is part of the tool kit for quality construction. Knitwear patterns are specifically made for knitwear. Some pattern companies will tell you outright on the pattern that its a for knits only project. But not always! Be very careful when choosing your pattern, because some pattern companies do not always make this obvious. If you are looking at a simple shirt, check the back of the envelope and look at the recommended fabrics. If it says stretch knits only, jersey, stretch wool or cotton, interlock, double knit, spandex- then you are looking at a knitwear project. Another clue is that if it doesn’t have a zipper or button closure, then its probably a knit project. Don’t despair, you can still make the project. But you will sew it differently than how you sew your non-stretch fabric. Stay tuned for next week, when I teach you how to sew, even when you are really, really, busy.